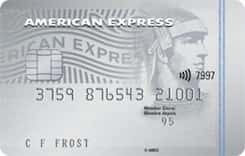 American Express is not responsible for maintaining or monitoring the accuracy of information on this website. For full details, current product information and Terms and Conditions, click the Apply now link. Conditions apply. This CAD currency 2 is issued by American Express and runs on the American Express Network. The purchase interest rate for this credit card is: 8.99 percent annually and the transfer balance interest rate is: 1.99% per year. Also the cash advance rate is: 8.99% per year. Travel cancelation is Not available for this credit card and also travel accidents are Included.